PRINCE RUPERT, BRITISH COLUMBIA -- The Port of Prince Rupert this week announced its largest Community Investment Fund contribution to-date in the community of Lax Kw’alaams, British Columbia. A total of $539,400 was invested in two projects that are enhancing the digital connectivity of the coastal village as well as providing new recreation opportunities for local youth. The Smart Community infrastructure project will modernize Lax Kw’alaams’ information technology systems, enabling the effective and efficient management the community’s computerized systems. The Outdoor Leadership Adventure Program provides the equipment and programming for the Coast Tsimshian Academy and recreation centre to offer activities like kayaking, biking and camping to families interested in organized or independent exploration of the surrounding region. The lack of modern information technology has proven a barrier to accessing essential government, industry and private sector initiatives for Lax Kw’alaams leadership in recent years. The extensive system upgrade will also benefit residents with greater access to online education and programs, bringing a wealth of opportunities to community members. The Smart Community project will see core networks established, with server and computer systems equipped with software and security that meets global standards for municipal administration and business communication. New phone, surveillance and alarm systems will improve digital and physical security of the IT network. Over the past two years the Outdoor Leadership Adventure Program has taken shape, beginning with basic training for students of the Coast Tsimshian Academy and expanding to include courses in kayaking and wilderness excursion for all interested residents. Many school staff members have become certified to instruct and lead a variety of recreation activities, which provide participants with practical skills as well as leadership and mentorship opportunities in the process. 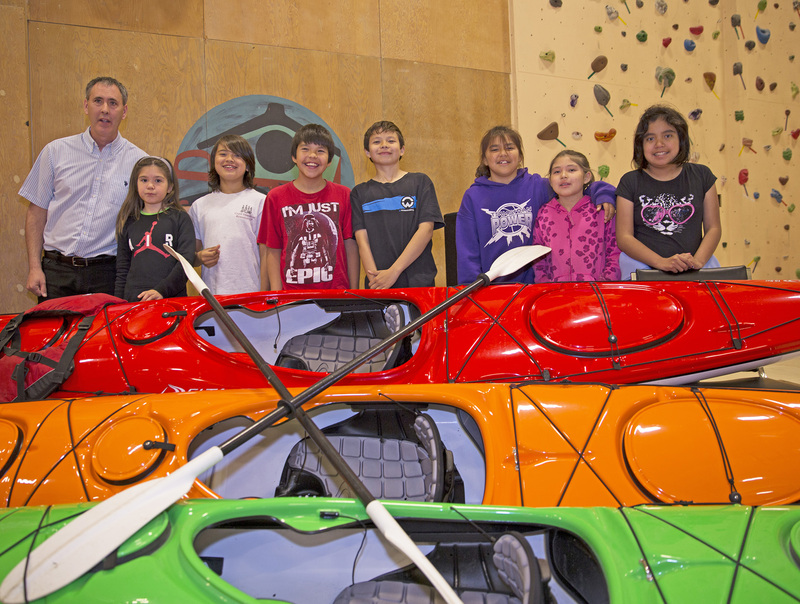 Principal of the Coast Tsimshian Academy, Kelly Rambeau, stands with students behind kayaks acquired through contributions received from the Port of Prince Rupert's Community Investment Fund.